This single story, 2237 sq.ft. 4 bedroom, 3 bath ranch style home had never been touched since its 1969 construction. With chopped up spaces and wasted, inefficient hallway square footage, this home was in need of a comprehensive renovation. With the client desiring a modern updated home with an emphasis on creating an open space for entertaining with a passion for cooking, our team made sense of this hodgepodge of rooms, opening the floor plan to create a warm but modern feel, keeping within the existing footprint of the house. A family room, living room and kitchen that were once divided into three narrow rooms, now are combined to form a continuous feel, separated only by large elliptical arched openings. 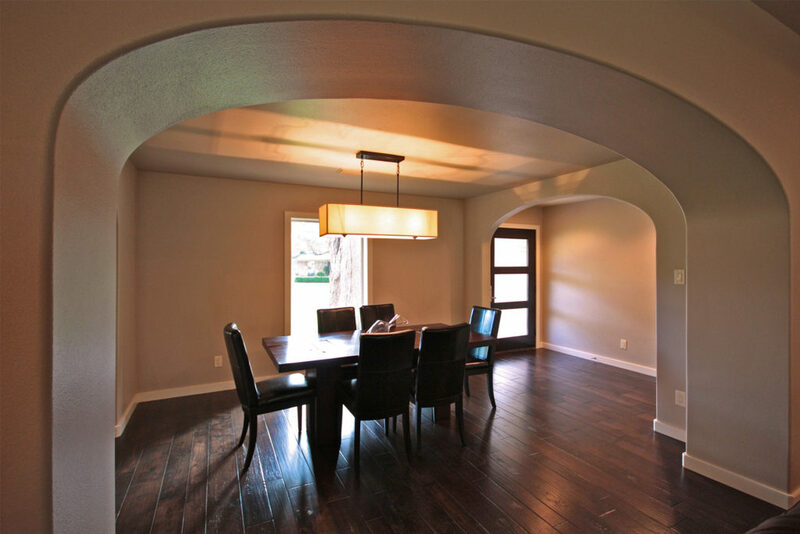 In the existing floor plan, one walked in the front door to be standing in the formal living area and physical doors led you to the hallway or family living rooms. The new floor plan invites you in the front door to a formal entry where you can see across the entire public space of the house, through the dining and into the kitchen, breakfast and living areas. A cramped shotgun style kitchen has been opened to the living room making this an ideal cooking/entertaining focal point of the house. A unique combination of sinks allows an area for storing dirty dishes, a disposal compartment, and a unique 2″ deep drain board sink for washing and prepping vegetables and other food. 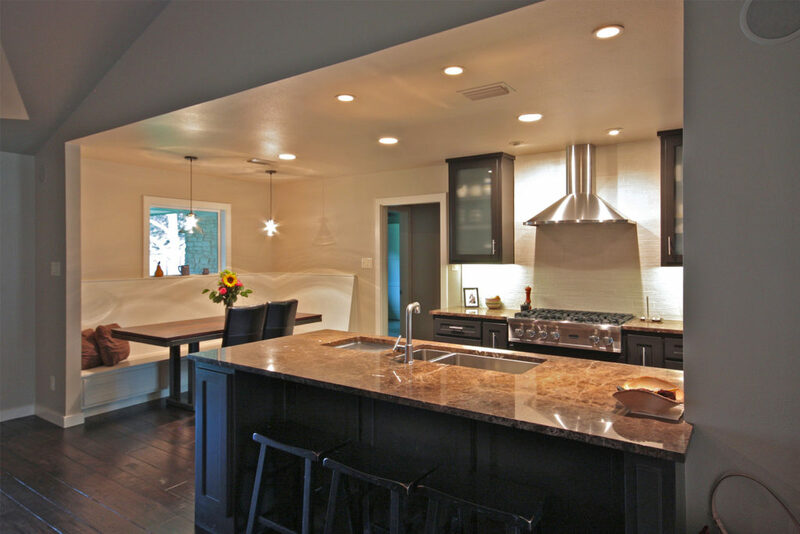 A custom built in breakfast nook and sitting area complete the kitchen remodel. 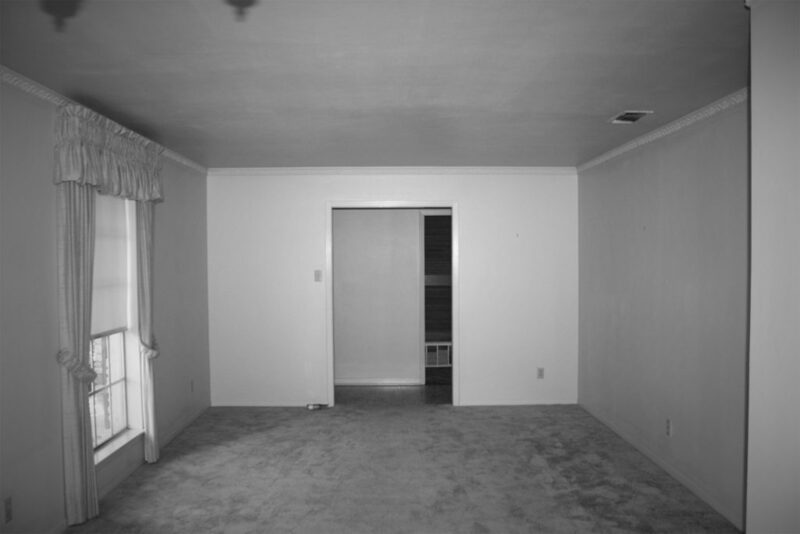 The long hallway that once led to a not so private or remarkable master bedroom, was eliminated to create a larger guest bedroom, master closet and a private entry to the newly secluded master suite off the living room. Large rolling barn doors open the master bath and closets to the bedroom, providing an open continuous feel to the room. New walk in shower with custom Ipe wood bench and rain shower head complete this incredible transformation. Difficult obstacles to overcome included re-supporting a sagging roof over the vaulted living space and re-rocking a structural fireplace without touching the existing roofing or stone on the exterior/top of the chimney that was left in place. A glue lam beam was added across the living area resting on the newly created clear span across the kitchen opening. Reclaimed stone from a previous project was chiseled into a modern drystack to replace the outdated stone on the fireplace and stone was toothed in to disguise windows that were moved or deleted on the exterior leaving a perfect match that is unrecognizable. 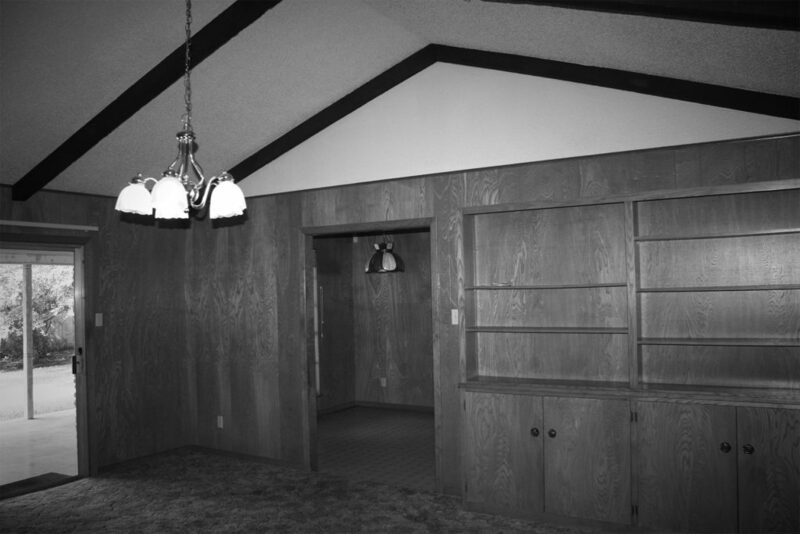 With hand scraped hickory wood floors, granite countertops, and top of the line Viking, Northland and Kitchen Aid appliances, gone are the days of shag carpeting, popcorn ceilings, and golden oak wood paneling. Special features include a recessed, wall mounted television with media closet directly behind accessed from the guest bedroom hallway. New Marvin Integrity windows and modern True Stile three panel interior doors throughout, as well as a custom mahogany with rain glass panel front door by BMC West, are finishing touches that bring the exterior up to date with the newly refreshed interior.